Dance Lessons – Swing or Nothing! Nathan teaches regular group classes and private lessons in swing dance and lindy hop at a variety of locations in San Francisco. Learn to Lindy Hop at the historic SF Women’s Building. Fun and friendly classes take place in the beautiful and spacious main auditorium, and will get you dancing quickly and confidently. Nathan hosts Cats Corner, the Wednesday Night Swing Dance Party at Balancoire Night Club. 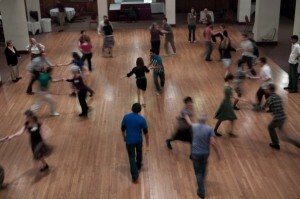 Cats Corner offers swing and lindy hop group dance classes from 7-9:30pm. After class, you can enjoy a full night of dancing to live music by top local swing bands, a full bar & restaurant, elegant lounge setting and friendly atmosphere. If group classes don’t fit your schedule, consider private lessons. Nathan teaches private dance lessons for individuals, couples and small groups at his home studio in San Francisco. Scheduling is flexible and multiple lesson discounts are available. Contact Nathan to schedule a lesson!